 From the 1903 book, 100 Years of Brewing, page 302. 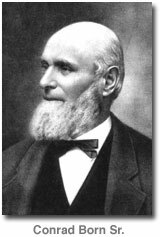 The plant at Columbus, Ohio, now owned and operated by Born & Company, had its origin in the small brewery founded by Conrad Born, Sr., in 1859. From six thousand to eight thousand barrels of lager beer were then manufactured annually. Mr. Born was a butcher by trade, and soon after establishing the brewery, formed a partnership with one Silbernagel. The firm was known as Born & Silbernagel up to October, 1864, when the former purchased his partner's interest and received his son, Conrad Born, into the business. The founder of the plant, now known as the Capital Brewery, died in June, 1890, and Conrad Born, the son above mentioned, is the senior member of the firm of Born & Company, the other members being C. Christian Born and C. Edward Born. In 1889 the management installed refrigerating machinery as a substitute for natural ice, its bottling department having been established for about twenty years. Malt has been made in the plant since the founding of the brewery; present annual capacity of the malt-house is about sixty thousand bushels of malt. The annual output of lager beer is now sixty-five thousand barrels. The firm makes quite a feature of its bottling business, bottling annually about twenty-five thousand barrels of beer. Annual capacity of the brewery is one hundred thousand barrels. Webmaster's Note: In 1904, Born & Company became part of the Hoster-Columbus Associated Breweries Co., a consolidation of Columbus breweries. The Hoster-Columbus Associated Breweries Co. continued to operate the Born & Company brewery until 1919, when statewide Prohibition went into affect in Ohio.